You’ve decided to create an online course. That’s great! But what will you teach? Maybe you already have a topic in mind. Maybe you have three dozen ideas and you don’t know which one to choose. Or maybe you are having a hard time coming up with any ideas at all. Regardless of where you are right now, this chapter will help you zero in on your “big idea” so that you can start planning and building your online course. Before we get into the exercise, let’s take a look at why people buy online courses in the first place. People spend money on courses that they think will help them solve a specific problem or reach a certain goal. Every person on the planet has at least one problem that they are trying to solve right now or one big goal that they are trying achieve. Problems and goals are really two sides of the same coin. If you think about it, we set goals by identifying problems or things that we want to change. Then we have to complete a set steps in order to get the result. The challenge that most people run into is that they either don’t have a clear path to get to the result they want, or they lack the motivation needed to take action. This lack of motivation usually isn’t related to laziness, but rather fear. Fear of failure. Fear of being judged. Even fear of success. Habits also play a big role in changing people’s behavior and getting them to take action toward their goals. If you’ve ever struggled with losing weight, you know what I’m talking about. Chances are you know exactly WHAT you need to do to lose weight, but your habits always seem to get in the way of doing the exercise and eating the right things. In this case, you need more than just a diet plan and an exercise routine. You also need accountability and support from someone understands what you’re going through. Your goal as a online course creator is to not only give your student a clear path to the result they’re looking for, but to also help them overcome the things that have prevented them from succeeding in the past. So the question then becomes, what problem are you going to help people solve? The best courses tackle problems or goals that you have personal experience with. This could be a problem that you are currently dealing with in your own life/career, or ideally something that you have struggled with in the past and then solved. It could also be a problem that someone else had that you successfully helped them work through. Maybe you’re great at home organization and you’ve developed a process for keeping your home tidy and clutter free. You’ve also helped friends and family improve their organization with your tips and advice. Maybe you have specialized training or experience that could help businesses improve their operations, become more profitable, or avoid liability. Maybe you have a child that used to suffer from panic attacks but you have been able to help him/her manage the attacks through a specific combination of dietary changes and relaxation exercises. Maybe you struggled with a computer program or a tool, but you’ve now mastered it. Or maybe you have developed a great eye for style, design, or makeup and can help others improve their personal appearance or the aesthetic of their home. As you can see, there are endless possibilities. But the point is, you have experienced your own unique problems, struggles, and desires. Use those experiences to create an inventory of your personal struggles, solutions, and interests. Identify at least three problems or goals that you are currently struggling with or actively pursuing. If you are having trouble coming up with ideas on your own, ask people who are close to you what they’ve seen you struggle with, where they’ve seen you excel, or how you have helped them in the past. The items in the first list are most likely things that you are currently interested in and/or pretty passionate about. The items in the second list are things that you have experience with. These are your proven skills. You might feel passionate or interested in these things, or you might not. Now, I want you to take a look at these two lists and put a star next to the one thing that has the potential to make the most impact on other people. In other words, which problem is the most painful? Which goal elicits the most desire? Which item is most worthy of creating a course around? Next, I want you to consider how you feel about this topic. What is your level of interest on a scale of 1-10? Would you be excited to help other people solve this problem or reach this goal? If the answer is “yes”, then this is it! This is your big idea. If the answer is “no” then you need to listen to that instinct. I’ve learned through experience that you should never write, teach, or create anything on a topic if your heart isn’t it in. It’s much better to work with a topic that you’re interested in and work to solve any knowledge gaps than to try creating a course around a topic that you know well, but that bores you to tears. People can always tell when someone isn’t in alignment with what they’re teaching and it tends to ruin the experience. Depending on where you are right now, you may have some extra work to do first. Or maybe it means that you document your journey and then incorporate the lessons that you learn into your course as you go. But maybe you’re already several steps ahead of where other people are and you can show them how to make progress towards a larger goal. That’s fine too. You don’t have to be the top expert in your field to get results for your students. You just need to be farther along in the process than they are. Take some time to brainstorm different ideas and then pay attention to how each one makes you feel. Udemy is a great company. They provide a valuable service to both online learners and course creators all over the world. My intention is NOT to bash Udemy in this post. However, I recently made the decision to stop selling my courses in their marketplace and I want to explain my thought process behind that decision. Let me first say that Udemy actually helped me get started with online courses. I was very nervous about creating my first course. I wasn’t sure if there was any interest in the topic I wanted to teach, so I created a short course and listed it for free on Udemy in 2013. Within a few weeks I had enrolled thousands of students, which was exciting! Udemy has a very active, engaged student community, so I was able to get feedback on my course very quickly. This feedback allowed me to validate that there was demand for my course topic and it also helped me refine and improve my course content before I launched the paid version. In retrospect, this exercise was incredibly helpful because it gave me the confidence to continue moving forward as an online course creator. Once I revised my course, my plan was to promote the paid version to the students that had enrolled in the free version on Udemy. Unfortunately, Udemy only lets you send promotional messages to students who are enrolled in a paid course. Since my course was free, I wasn’t allowed to promote to my existing students. As it turns out, Udemy has a lot of rules governing how and when you can communicate with your students, and even how much you can sell your course for. While I know that some people have been successful on the platform despite all of the rules, this was a deal breaker for me. When you sell your course on Udemy, your students aren't really yours. Udemy collects contact information from your students but they don’t share it with you. You don’t own that data. They do. If you sell anything online, whether it’s books, courses, products, or services, you know that your email list is your biggest asset. In my business, it’s important for me to collect information about the people who engage with my content because I don’t just sell courses. I also offer services. I write books. I have relationships with other businesses that allow me to promote products that are helpful to my audience. But if I can’t contact the people who enroll in my courses or engage with my content, my ability to grow my business becomes very limited. At this point I decided to start using Teachable to sell my courses from my own website. Teachable is independent online course hosting platform. It’s not an online course marketplace like Udemy. Teachable will NOT promote your courses for you. But they do give you access to all of your students’ information. If you are going to use an independent course hosting platform you will need to do your own marketing to enroll students in your courses. I know that this turns a lot of people off. There are a lot of creators who would rather upload their content to a marketplace and let someone else deal with the marketing and advertising. But let’s look at what that really costs you. Udemy will ONLY promote your courses if you enroll in their marketing program. When you enroll, Udemy can (and usually will) offer your course at a deep discount. It’s common to see courses that are normally priced for $199 (which is the highest price Udemy allows) for as little at $9.99. If someone finds your course on Udemy, your revenue share is 50%. If your course is already discounted to $9.99, your cut is less than $5 per sale on a $199 course. If someone finds your course after clicking on one of Udemy’s paid ads, your revenue share drops to 25%, leaving you with a $2.49 profit on a $9.99 sale. I know there are people who will say, "I'm okay with that. Those are sales I wouldn't have made otherwise." But, this can hurt you in ways that you may not have considered. I had my course listed on my own site AND on Udemy for $199. I was enrolled in the Udemy marketing program and my course was almost always “on sale” for either $9.99 or $12.99. I also offer a 30-day refund policy to anyone who purchases my course on my site. I could have chosen not to do this, but student satisfaction is my number one priority. What would you do if you bought a course for $199 and a few days later found it on sale for $9.99? Most people would return it or ask for a refund for the difference. Students that bought my course at the full price of $199 from my website felt cheated once they saw that they could get the same course on Udemy for under $10 - and understandably so. This misstep cost me thousands of dollars, not to mention countless hours that I had to spend responding to refund requests and trying to negotiate with upset students. Once I stopped selling my courses on Udemy, my refund rates dropped to less than 1%. I’d love to know your thoughts on this. Post your opinion in the comments below. Download my free 25-page “fill in the blank” style workbook and start creating your profitable online course today. Creating on online course is a great way to supplement or even replace your full-time income. Almost everyone has a special skill, hobby, or knowledge that they can package and sell as an online course. But many online course creators don't actually have a plan for making the amount of income they desire from their online course. Rather, they leave it up to chance and hope for the best. This usually results in disappointment mixed with feelings of confusion and helplessness. I want to help you avoid this by showing you EXACTLY how to reach your income goals each month using a simple math equation. Your conversion rate — the percentage of people who purchase your course after seeing your offer. You can download a copy below and plug in your own numbers as we go along to see exactly what you’ll need to do to reach your income goal with your online course. If you already have an online course add the title(s) in the first column of the spreadsheet. If you don’t have an online course yet, that’s okay. The purpose of this exercise is to help you create a plan to reach your income goals so just write in your course idea or proposed course titles. In column B add the price of your course. Again, if you haven’t created your course yet, that’s okay. Also, feel free to play around with the course price to see how that effects the number of sales and subscribers that you’ll need to reach your goal. How much do you want to make each month from your online course? Don’t be afraid to set a goal that is a little bit uncomfortable or that seems somewhat beyond your reach right now. Take a few minutes to think about this, then add your answer in Column C.
I like to set monthly income goals for my online courses, but you can change this to annual, quarterly, weekly, or even daily by clicking on the drop down box in Row 6, Column C of the spreadsheet. If you’ve already launched your course and know the percentage of people who purchased after seeing your offer, you can enter that into Column D.
If you haven’t launched your course yet or don’t have sales conversion rate data, a good number to use for planning purposes is 2%. Once you add your course price, income goal, and conversion rate numbers into the spreadsheet, it will automatically populate the number of sales and leads that you will need to get to hit your income goal. In my example, my goal is to make $15,000 a month from my course. In order to do that, I would need to make roughly 50 sales (Column E) at $297. You can also break these numbers down into weekly goals. So, for example, if I know that I need to get 50 sales and 2,525 leads per month, I can divide that number by 4 (because there are usually 4 weeks in a month), and then I’ll know that I’ll need to make around 13 sales each week and get 631 new leads to stay on track with my monthly goals. Now, reaching my monthly income goal is just a matter of figuring out how to attract the number of leads or subscribers that the spreadsheet tells me I need to get. 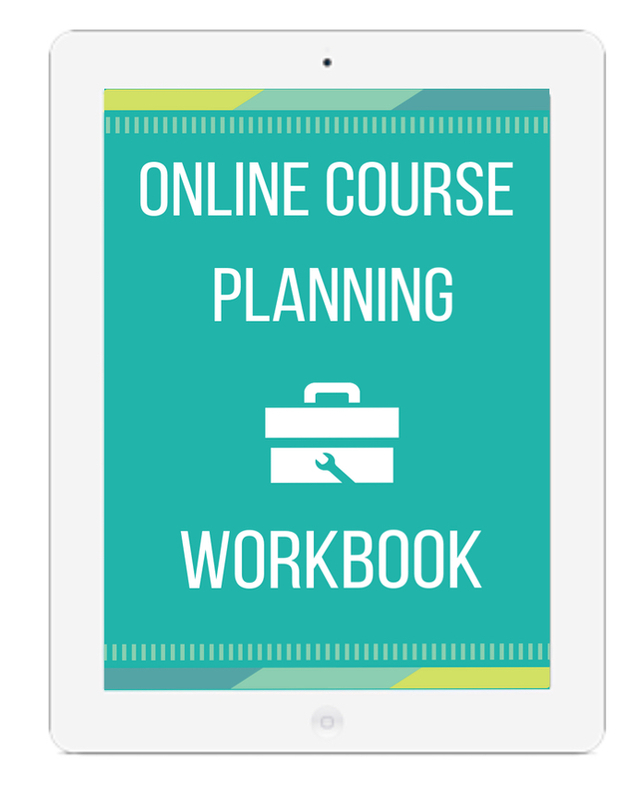 Plan your profitable online course with my FREE 25-page Online Course Planning Workbook. In this post I'm going to break down what each plan offers (and what I used it for) in the hopes that it will help you choose the Teachable pricing plan that is the best fit for where you are in your course business right now. * You can switch your plan at anytime if you are on a monthly billing cycle, however you will save some money if you sign up for an annual plan. Technically, you could run an entire online course business on Teachable's free plan, but this may or may not the *best* option for you. Who should use the free plan? If you are brand new to Teachable, the free plan is a great way to get familiar with the platform before you buy. I stayed on the free plan while I was setting up my course. But there are some major drawbacks to selling your courses on the free Teachable plan. The most obvious is the transaction fees. Do the math on "free"
If you're selling courses on the free plan, you'll end up paying $1 + 10% on each course sale. For example, if your course is priced at $200, you'll end up paying $21 of each sale to Teachable if you're on the free plan. At this rate, if you sold more than 5 courses a month, you would be better off upgrading to the $99/month Professional plan (which has no additional transaction fees) and benefiting from the increased functionality and instant payouts. In my opinion, the free plan is great for getting your course set up, but not the best option for launching or selling. Once you're ready to start selling your course, I highly recommend upgrading to the $99/month Professional Plan if you have room for it in your budget. If not, the $39/month Basic plan is a better option for selling your course than the free plan, but it does have some drawbacks that you need to be aware of. Who should use the Basic Plan? 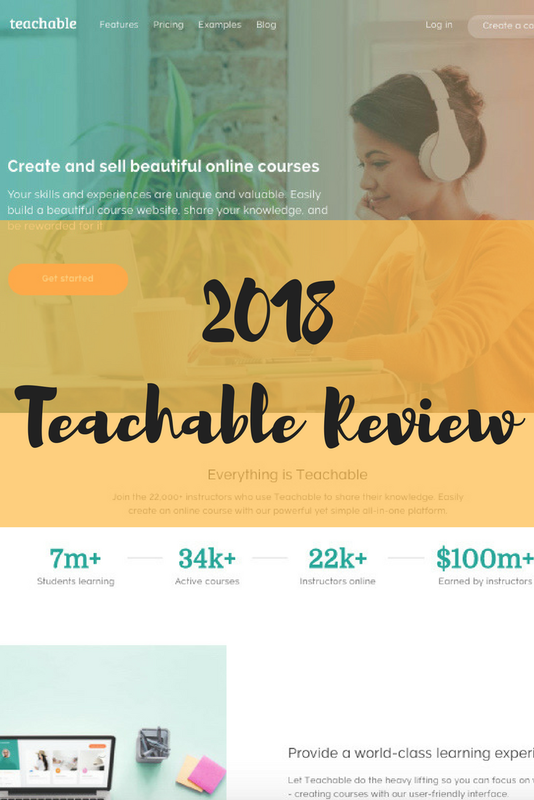 At $39 a month, Teachable's Basic plan is fairly affordable which makes it an attractive option for most new course creators who are working with a tight budget. you can have up to two authors/owners for your school. Teachable charges a 5% transaction fee on every course sale. You must use Teachable's "payment gateways" which means that you don't get instant access to your course revenue. You are required to offer a 30 day refund policy. If someone purchases your course while you are on the Basic plan, Teachable will hold your funds for the 30 day refund period. If the student does not request a refund within 30 days, Teachable will deposit the funds into your Paypal account the following month during their payout period. On average, I had to wait about 45 days from the time I made a sale to the time the funds hit my back account. That might be fine if creating courses is just a hobby and you're able to cover all of your expenses with other income. But that's a long time to wait if you're trying to bootstrap a legitimate business or side hustle. On top of that, you have to pay Teachable a transaction fee of 5% for every course sold on the Basic plan. If your course is priced at $200 and you make 10 sales in one month, you'd end up paying $100 in transaction fees on the Basic Plan. The Pro plan is $99 a month but has no transaction fees, therefore, if you were to sell more than 10 courses a month at this price point, you'd actually be losing revenue by staying on the Basic Plan. This part can seem counter intuitive, but it's important to crunch the numbers to see where your "break even" point is on each plan so that you can maximize your course revenue. You're willing to wait at least 45 days to get access to your funds. Who should use the Professional Plan? In my opinion, this is the best plan for people who are serious about turning their course into a legitimate source of income. The most important feature of the Professional plan, in my humble opinion, is the instant payout feature with no additional transaction fees. When you're on the Pro plan, you can integrate your PayPal and Stripe accounts right into Teachable so that all of your course revenue goes straight to you instead of being processed through Teachable's payment gateway. Another good thing about the Pro plan is that offering refunds is optional. I actually prefer offering a 30 day refund policy on my courses, but you may want to have a stricter policy where students are required to show their work or no policy at all. This plan gives you the freedom to choose how you want to run your business. You also get advanced reporting tools so that you can monitor completion rates and see exactly where your students are in the course. This is great for identifying weak or trouble spots in your course curriculum. And the final thing that I'll mention about the Pro plan is that it offers a lot more flexibility when it comes to customizing your school. You get access to the "Power Editor" which lets you add custom code to your school to change the functions and designs to meet your needs. You also have the option to integrate additional third party apps like Zapier so that you can do a lot more with automations. Who should use the high volume plan? The High Volume plan is for people who want to have more than five owners or authors for their school. If you're a larger organization and need to have multiple admins or instructors who need access to the platform to upload materials, then this plan is for you. Are you considering using Teachable to host your courses? If so, which plan do you think you'll use? I'd love to hear your thoughts and questions in the comments below. Grab my free 25-page “fill in the blank” style workbook and start planning your profitable online course right now. Disclosure: Some of the links below are affiliate links, meaning, at no additional cost to you, I may earn a commission of you click through and make a purchase. I've been using Teachable to host my online courses for about three years now, so I thought I'd share some of the things that I love about the platform, and some of the things I think could be improved. If you're not familiar with Teachable, it's an online software program that allows you to create and sell your own online courses. Teachable is very similar to other independent third party course platforms I've tried, like Thinkific. However, it's not an online course marketplace like Udemy. However, I do have plenty of GOOD things to say about Teachable. I've been able to grow my online course revenue to over $12,000 a month on this platform, essentially on autopilot. So make sure that you read about all of the GOOD things this company has to offer online course creators as well. 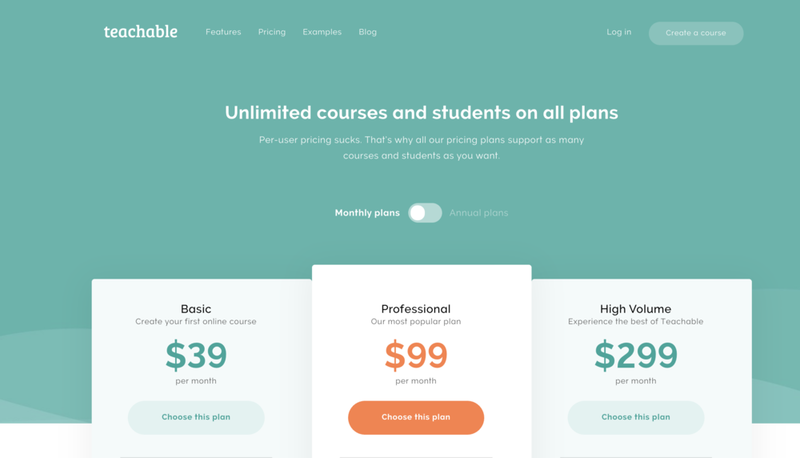 My biggest complaint about the Teachable platform is that you have to subscribe to their $99/mo Pro plan if you want to have immediate access to your course revenue. If you are on the Free or $39/mo Basic Plan you have to wait six to eight weeks to get paid out from Teachable. When you are just getting started and trying to bootstrap your online course business, having immediate access to your funds is essential. I know for me personally, I would roll all of my course revenue back into paid ads to pay for traffic so that I could continue to grow my course profits month after month. I wouldn't have been able to to that if I had to wait two months to get paid out from Teachable. To be fair, the reason why Teachable does this is because they offer a 30 day refund policy on all courses purchased on the Free or Basic plan. They hold all course revenue for 30 days and then they pay you out the following month. I have no issues with offering a refund policy personally, however, I'm not a fan of Teachable requiring that people offer a refund when they are paying for an account. If this were limited to the free plan only, I would feel a lot better about it. Now, if you are on the $99/month Pro plan you get to connect your own payment gateways (PayPal and/or Stripe) and your funds will be paid to your directly instead of having to go through Teachable's payment processor. Bottom line: if you plan on selling more than $99 worth of courses in a month, I'd highly recommend upgrading to the Pro plan because it will give you instant access to your funds and you won't get hit with extra "transaction fees" so you actually get to keep more of your money. Downside #2: It's hard to FIND the free plan. As you can see, the FREE plan is not highlighted here. If you want to try out the service for free you need to have a REALLY good eye. There is a link to sign up for the FREE plan at the bottom of the page, but you have to look for it. I don't want to sound too entitled here. I'm grateful that they offer a free plan at all. They certainly don't have to. I just wish they would make it easier to find. I'm sure that Teachable has a good reason for "hiding the ball" so to speak. Maybe they've tested this in the past, but I'm a big fan of how Thinkific really promotes their free plan BEFORE promoting their paid plans. For comparison, here's the top section of Thinkific's homepage. Downside #3: You can't fully "white label" your school. One of the major reasons why many course creators choose Teachable is so that they can have more control over their online business. While it's true that Teachable gives you nearly complete control over your marketing, course content, pricing and how you communicate with your students, there is one little drawback: they don't offer fully "white labeled" schools. When something is fully "white labeled" it means that there are no logos or references to the software company on your site. When other companies' logos and URL's are present on your site it can cause confuse your customers. For example, imagine you're buying something on Amazon, and they all the sudden, when it's time to checkout, you end up on some other site that you don't recognize. It can feel a bit sketchy. The most noticeable place where this is an issue is with the roll out of "My Teachable" accounts. What's the issue with "My Teachable" accounts? When Teachable first launched, students were required to create a new account for every Teachable hosted school that they signed up for. This was fine because it meant that your students had a specific account for your school only. 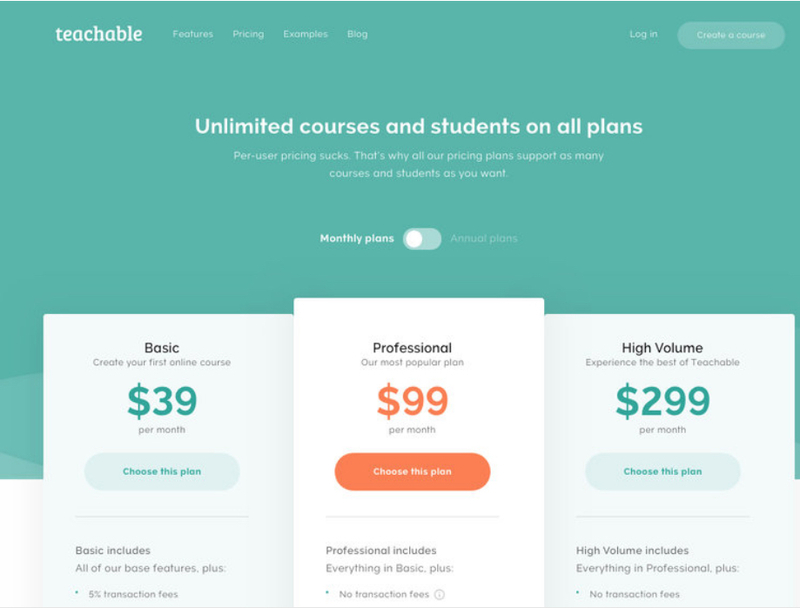 In an attempt to streamline the process for students who may end up enrolling in more than one Teachable hosted school, Teachable came out with "My Teachable" accounts that gave students access to all Teachable hosted courses that they were enrolled in regardless of whether they were taught by the same instructor or not. As you can see, if someone goes to sign in or sign up for the "Idea Babies" school, they are going to see quite a few references to "Teachable" which is not my brand, nor it it something that my students are likely to be familiar with. That is really the extent of the "bad." Now let's talk about what I LOVE about Teachable. You could theoretically run an entire online course business using Teachable for free. This might not be the best choice for everyone, but it's definitely possible. AND you can even set up your own custom URL for your school. Now, obviously many people do choose to have a separate website or use more advanced email management services, (I prefer ConvertKit myself) but the point is that you actually don't NEED all of that stuff if your goal is to create a course for free. Love #2: So easy to use. 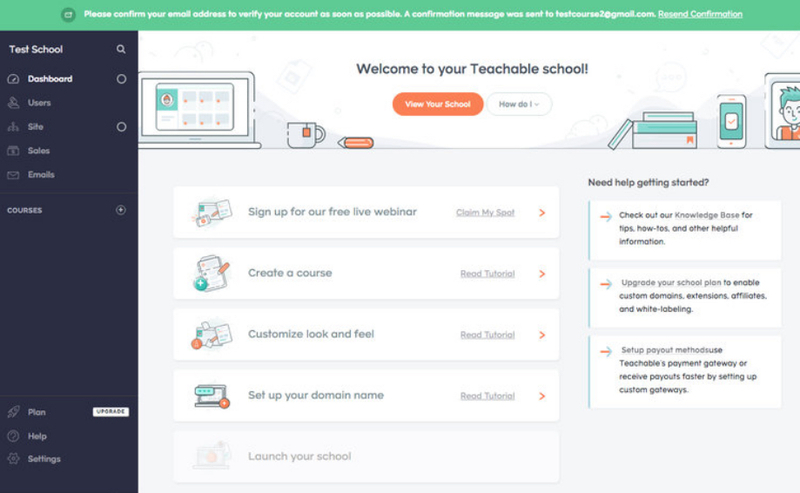 Everything from the signup process to creating your school is incredibly easy with Teachable. In fact, I'm going to go out on a limb and say that it's one of the easiest software platforms that I've ever used. I've tested similar course platforms like Thinkific, New Kajabi, Udemy, and Podia as well, but Teachable was by far the easiest to get the hang of. Once your inside of your Teachable account (free or paid), there are a number of helpful resources waiting for you. You can sign up for Teachable's free weekly live QuickStart Webinar (highly recommended). This will walk you through the process of setting up your school and creating your first course inside of Teachable. Or you can jump right in to creating your first course or customizing the the look of your school. Teachable also has an extensive "Knowledge Base" full of tutorials and answers to commonly asked questions. If you get stuck at any point, you have immediate access to the knowledge base right from within your account. Even if you are on the free plan, there's no limit to the amount of videos you can upload or courses that you can create. At first glance, this might not seem like a big deal to you, but if you've ever tried storing your video on a service like Vimeo or Wistia, you know that video bandwidth fees can add up fast. There's no limit to the number of student accounts that you can have on your school EVEN IF YOU'RE ON THE FREE PLAN!!! Regardless of whether you are just getting started with your first group of students, or whether you have thousands of students in your course, Teachable doesn't charge you more for additional student accounts. It's built to scale as you grow your online course business. Want to release your course modules over time? It's possible with Teachable. Studies have shown that releasing content over time helps keep your students engaged and prevents them from becoming overwhelmed by too much content all at once. You can set a specific date that you want your course to start or you can set the course to "evergreen" mode to release modules on a schedule depending on when a student enrolls. This feature is available on Teachable's Basic plan and up. Want to maximize your course revenue by offering relevant add-on's during the checkout process. Teachable supports it. I've seen everything from additional courses, templates, workbooks, or even 1-on-1 coaching offering as an upsell on the Teachable platform. The sky is the limit. Want to offer a payment plan for your course? You can do it with Teachable. Want to create recurring monthly revenue by turning your Teachable School into a membership site? You can do that too! You can even offer different coupon codes to your students to give them access to various discount levels on your course. Want to work with affiliate or joint venture partners to get more students in your course? Teachable let you set assign affiliate links to your JV partners, track sales and even pays your affiliates out for you. If you sign up for Teachable's Pro plan you can customize almost any aspect of your Teachable School through the "Power Editor." You can also add additional functionality through Teachable's Zapier integration. If you are on the free or basic plan, you still have the ability to change the look and feel of your school, you just won't have access to the advanced code editor. Teachable has oodles of data on what it takes to create a successful course because they get to see behind-the-scenes of the thousands of schools that have been built using the Teachable platform. Go here to learn more about these bonuses! As you can see, no platform is perfect, but there's a lot to like about Teachable. Email marketing is the lifeblood of your business. If you're an author, course creator, or business owner of any kind, you need a way to collect contact information from potential customers, readers or students so that you can communicate and build a relationship with them over time. Like most new business owners, you probably wanted to spend as little as possible because, let's face it, every dollar counts. You found out that you could collect email address with Mailchimp for free and that sounded like a pretty god deal to you at the time. But as time went on you started to feel limited in what you could do with the service. Trying to figure out how to do things that should be simple became a frustrating task that ate up hours of your time. Since Mailchimp counts subscribers multiple times if they sign up for more than one of your lists, you quickly hit your "free" account limit of 2,000 subscribers. I went through this growing pain last year when I started getting serious about growing my online business. So I started looking for alternatives. Aweber seemed like a decent option, but I quickly ran into many of the same limitations that I was trying to get away from by leaving Mailchimp in the first place. I looked at half a dozen other services like Ontraport, Active Campaign, Infusionsoft, etc. and they seemed really complicated and EXPENSIVE! I needed a platform that was easy to use on my own without hiring an expert to get me up and running, but that had some of the more advanced features that the more expensive platforms had like the ability to create automation rules, deliver multiple lead magnets, and segregate my list so that I could custom tailor my marketing messages. That's when I found ConvertKit. With ConvertKit you can create unlimited forms, automated sequences, standalone landing pages, live broadcast emails, and easily organize your subscribers using tags and segments. Best of all, you don't get charged multiple times for having the same subscribers on multiple lists like Mailchimp does. Their automation rules are sophisticated enough to allow you to create custom automated sequences that include or exclude subscribers based on certain criteria. For example, in my online course business, once a student purchases one of my courses, I can set up a rule that will prevent them from be bombarded by more sales emails for the same course. If you don't do this, you'll annoy your current customers pretty quickly and that's never good. Once I saw what this platform could do, I was sold. My next step was to figure out how to make the switch from Mailchimp to ConvertKit. I felt a little nervous about doing this at first, but it was easier than I expected. I'm going to walk you through each step that you'll need to take in this tutorial. The first thing you'll need to do is set up a ConvertKit account. You can get a 1 month free trial if you use my referral link. It doesn't cost anything extra for you, but I will receive a small commission if you use my link. Every little bit helps! This offer isn't available publicly so make sure you click the button below to get it! Try ConvertKit for 1 Month FREE! Get started by creating your account. Just enter your email address and choose a password. Next, you'll be asked to enter your billing information. Don't worry, you won't be charged until after your free 1 month trial ends. If you decide you don't like ConvertKit after trying it, you can always cancel your account before your trial is up and you won't be charged anything. If you don't cancel your trial membership, you'll start getting charged for the service in 30 days. 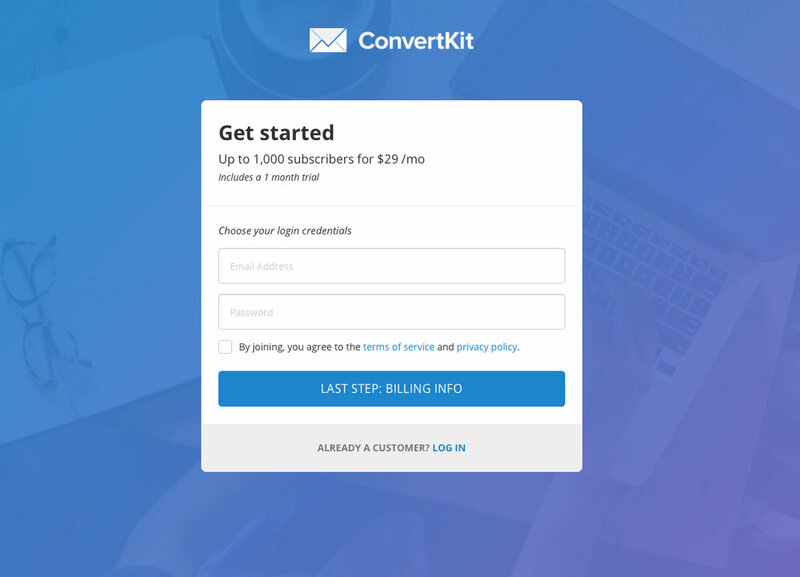 ConvertKit is $29 a month for up to 1,000 subscribers. If you have more than 1,000 subscribers you can view the different pricing tiers here. In Mailchimp you organized your subscribers into different lists. You can see in the example above that I have three different lists that I will want to import into ConvertKit, so I'll want to create a tag inside ConvertKit for each one so that I can keep them neat and organized when I switch them over. You can create a tag in ConvertKit by first going to the "Subscriber" menu. Next click the "+Create a tag" link at the bottom of the right hand column. You'll see a box appear where you can type in the name that you want to assign to the tag or category of subscibers. Once you create your tag, it will appear in the tag list in the right hand column of dashboard. Now it's time to log into your Mailchimp account and export each of your lists. Navigate to your "lists" page and click on your first list. Next, click on "Export list." Mailchimp will send you an email with your exported list attached. You'll need to download before you continue. 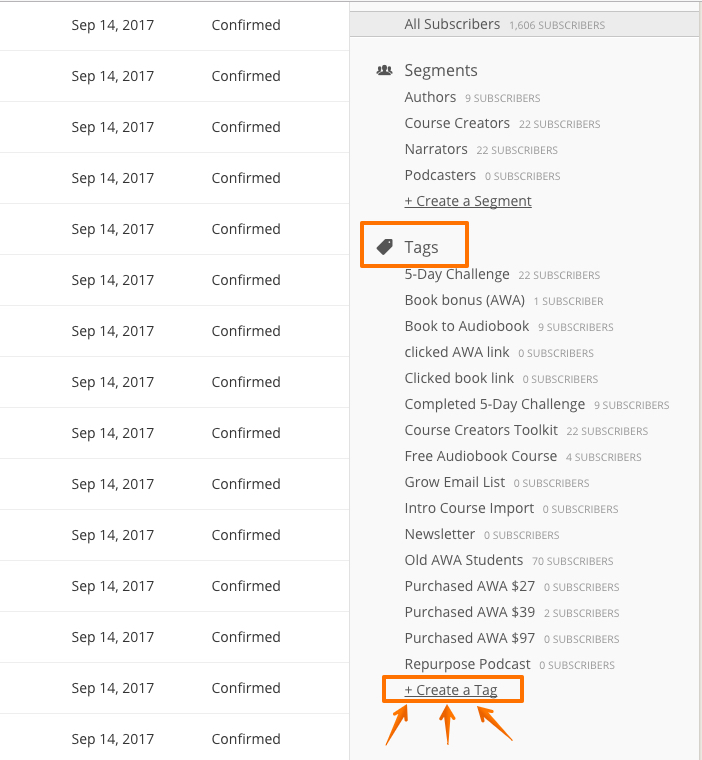 Now that you have downloaded your list from the email that Mailchimp sent you, head back over to ConvertKit and click on the "Subscriber" tab. Next, find the button that says "Import Subscribers" and click it. Next, click on the option that says "tags" and then choose the tag that corresponds to the list that you are importing from Mailchimp. In my case, I'm importing "List #1" and so I want to click on the tag that says "List #1" that I already created. In Step #2. 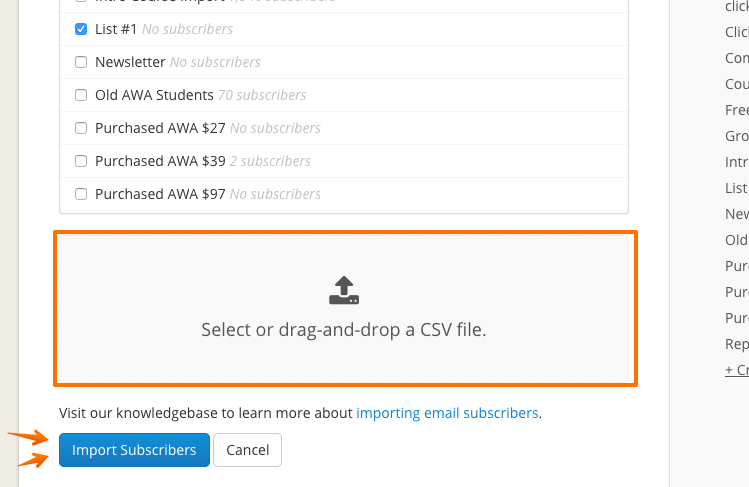 Next, you'll need to drag your CSV file that Mailchimp sent you via email to the box that says "Select or drag-and-drop a CSV file." And that's it! Just repeat the steps for each of your MailChimp lists. You can view your complete list of subscribers by clicking on the "Subscribers" menu at the top of your dashboard. You can view your individual lists by clicking on the tags located in the right hand column of the Subscriber page. ConvertKit makes it incredibly easy to import, export and manage your contact lists. Would you like to learn more about how to use ConvertKit to grow your online business? I'm putting together a FREE ConvertKit Masterclass that will walk you through the entire platform from creating simple forms and landing pages to planning complex email sequences and automations. FREE ConvertKit Masterclass coming soon! The free tutorial is almost done. If you'd like me to send you an invite to the masterclass, just click the button below and enter your name and email. If you have any specific questions about ConvertKit that you'd like me to cover in the free masterclass, leave a comment below and I'll do my best to make sure you get an answer! But audiobooks aren’t JUST for authors. I’m willing to bet that if you’re a blogger, podcaster, speaker or online course creator, you probably haven’t given much thought to expanding your reach and growing your brand through audiobooks. Maybe you thought audiobooks were only available to authors? Maybe you just haven't considered how audio fits in with your particular business? The myth that I want to crush right now is the idea that audiobooks are ONLY appropriate and beneficial for traditional authors.